Transition risks: The risks to businesses or assets that arise from policy and legal actions, technology changes, market responses, and reputational considerations as the international community seeks to slow the pace of climate change by transitioning to a lower-carbon economy. 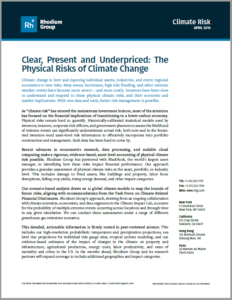 Physical risks: The risks to businesses or assets emanating from changes in the climate that are already occurring and are projected to continue in the years ahead, under a range of different greenhouse gas emissions scenarios. These can be event-driven, such as increasingly intense and frequent storms, or related to chronic, longer-term shifts in precipitation and temperature. A growing number of companies are quantifying and disclosing transition risk in some form. In 2016, more than 2,500 companies provided some kind of emissions reporting, either in their annual report or to third-party organizations. Simultaneously, more companies are adopting targets for reducing greenhouse gas emissions and tracking progress towards meeting those goals. In contrast, companies have made very little progress on physical climate risk disclosure to date. The few companies that report risks do so in a qualitative manner—giving investors little information about the financial implications of physical climate risk and likely underestimating their magnitude. Such blind spots are particularly concerning to the regulators responsible for ensuring financial system stability. In late 2017, a group of these regulators formed the Network of Central Banks and Supervisors for Greening the Financial System (NGFS) to “exchange experiences, share best practices, contribute to the development of environment and climate risk management in the financial sector.” A survey published by NGFS in October 2018 found that Central Banks and Supervisors have “started to actively assess the impact of climate and environment-related risks on prudential risks,” but noted that their ability to do so effectively is constrained by data availability. This paucity of good physical climate risk information applies to publicly-traded companies and a range of other assets, from municipal bonds to real estate to sovereign debt. Both the TCFD and the NGFS have called for better physical climate risk information for asset, firm, portfolio, and financial system-level analysis. However, a number of obstacles limit production of such information: the complexity of climate system modeling; the difficulty in quantifying the economic and market impacts of climate change; and vast scope of computing infrastructure required to report damages at an asset level—around the world and across a range of emissions scenarios. In 2013, Rhodium Group set out to solve this challenge by forming a team of climate scientists, economists, and data engineers. Through our collaboration as the Climate Impact Lab, Rhodium Group and its partners are integrating historical, real-world data and cutting-edge economics to produce the world’s most detailed quantification of the global impacts of climate change, sector-by-sector, and community-by-community. This peer-reviewed research has been featured in the New York Times, the Wall Street Journal, the Economist, the Financial Times and elsewhere. Rhodium Group is building on this work to provide evidence-based, asset-level data to companies, investors, and regulators seeking climate risk information. We provide probabilistic estimates of how the frequency of extreme weather events—from heat waves to hurricanes—are changing across an investor’s portfolio or within an individual company’s supply chains and markets. We then quantify the impact of these changes on a wide range of economic and investment outcomes—from agricultural yields to home values—using both econometric and process models. By connecting science, economics, and scaleable cloud computing we are able to provide the kind of actionable climate risk information called for by the TCFD and NGFS. 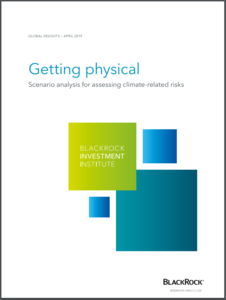 To demonstrate how investors can use this kind of asset-level data to conduct TCFD-consistent physical climate risk assessments, we partnered with BlackRock, the world’s largest asset management company. BlackRock used our data to perform a first-of-a-kind quantitative physical climate risk assessment for three sectors with long-dated assets—US municipal bonds, commercial mortgage-backed securities, and electric utilities. BlackRock published the results of that analysis here. A supporting Rhodium report is available here. To learn more about Rhodium’s Climate Risk data and research services please email climaterisk@rhg.com or call +1.212.532.1157. Our independent analysis of a plan to dismantle U.S. electricity markets formed a coherent argument for those fighting the proposal.